In their efforts to manage the costs of meeting the demand for housing, UCSC administrators may have entered into contractual negotiations with Capstone Development without a full picture of its past as a company. UCSC selected Capstone Development to take part in a public–private partnership (P3) to build a new residence hall, SHW, at the current site of Family Student Housing (FSH), which will be relocated to the bottom of the East Meadow, near the junction of Hagar and Coolidge/McLaughlin. Part of the Long-Range Development Plan, SHW is designed to cater to upperclassmen, who have few if any opportunities for on-campus housing without a housing guarantee. The P3 option was chosen to better manage the project’s potential debt, which director of Employee Housing and Capital Planning Steve Houser said was over $600 million. While Capstone Development was chosen as its developer, SHW will legally be owned by the Collegiate Housing Foundation, a non-profit, to secure a lower interest rate. That is to say, UCSC will bear the brunt of many operational costs for more than a decade. Houser said that Capstone Development was chosen because of their extensive, nationwide history with student housing projects and sustainable project design. Capstone Development, however, has a contentious legal history. The Hartford Courant reported that a Capstone Development project at the University of Connecticut, which is not listed in its project portfolio, was discovered to have a carbon monoxide leak due to faulty ventilation that required $650,000 to repair, along with other fire and building code violations. Capstone Development also partnered with Capstone Building as the general contractors for the construction of Roulhac Hall at Stillman College. During that project, a 16-year-old worker fell from a roof 26 feet to his death due to a lack of fall protection compliant with Occupational Safety and Health Administration (OSHA) standards. This incident was also a violation of federal child labor laws, as workers under the age of 18 are forbidden from working on roofs. Just two months earlier, Capstone Building was cited by OSHA for failing to provide fall protection while serving as general contractor for the construction of a residence hall of similar height in Eugene, Oregon, which was also developed in partnership with Capstone Development. While Capstone Building Corporation and Capstone Development Partners are not related entities, the two companies partnered together for the large majority of Capstone Building projects from 1998 to 2005. The Student Housing West Advisory Committee (SHWAC), a student-run committee meant to provide input for the negotiating process, may not be aware of these issues either. “Personally, I was aware of an incident occurring involving Capstone Development Partners but [I’m] not sure if the rest of the committee knows,” said Ted Cheung, fourth-year student and Merrill College representative for SHWAC, in an email. UCSC Vice Chancellor for Business and Administrative Services Sarah Latham stressed in an email the distinction between Capstone Building Corporation and Capstone Development Partners and noted that Capstone Building Corporation was not a part of UCSC’s partnership. Latham also said that prospective developers were asked to disclose their lawsuit information during the selection process, and had done so. Capstone Development will play a major role in maintaining and managing the facilities for the duration of the contract, which has not been finalized but will likely last between 30 and 40 years, Steve Houser said. 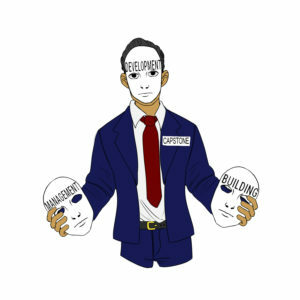 Capstone Development itself, however, doesn’t provide management services. Student Housing West will instead be managed by Capstone Management Partners, a subsidiary of Capstone Development. Capstone Development itself is just one arm under the collective umbrella of Capstone Companies. Founded in 1990, Capstone Companies formally split itself into four separate companies in 2011. The companies operate through a network of multiple subsidiaries. Capstone Development, Capstone On-Campus and their subsidiaries specialize in on- and near-campus developers and property managers, respectively. Development, construction and management of off-campus housing sites are all done by Capstone Collegiate Communities and their subsidiaries. Purchases and renovations of existing properties are handled by Capstone Real Estate Investments. The companies and their subsidiaries each have significant overlaps in personnel. The four parent companies all have executives who were part of the former Capstone Companies, and in some cases members of those executives’ families. Multiple executives serve in both a parent company and their subsidiaries, such as executive officers L. Jeff Jones and Bruce McKee, who each serve both on the board of Capstone Development and of Capstone Management Partners. All four parent companies, and some of their subsidiaries, are housed in the same business park. James M. Wagstaffe, partner of the San Francisco law firm Kerr and Wagstaffe, who also advises City on a Hill Press, said there’s nothing illegal about such overlaps in leadership, but it can indicate that legally separate entities have some awareness of each other’s activities. Wagstaffe also said businesses will often layer themselves, or split themselves into multiple entities, to achieve certain goals. UCSC is currently working with Capstone Development under a pre-development agreement to finalize the design, financing and contracting options behind the project before executing the agreement, Houser said. He expects the agreement to be executed in the summer or the fall of 2018. Additional reporting by H. Ann Browning, Sarah Belle Lin and Timothy Tsung.